Thinking about traveling to Northern Vietnam? Then don’t miss Ninh Binh! If you are planning a visit or maybe you just want to check on your accommodation options, here are my recommended places to stay to make the most of your trip! Picture this: leisurely sitting on a boat, floating down a river with yellow rice fields and limestone karsts jutting out of the water on both sides in Tam Coc-Bich Dong and Trang An. This scene is peaceful– there is no noise, except for the sounds of birds chirping and the oar of your boat hitting the water. How about doing a little “exercise” by conquering 486 rocky stairs to reach the top of Mua cave for a perfect view of Ninh Binh province or wandering around Bai Dinh pagoda and Phat Diem church to learn about the architecture and religions of the Vietnamese people? As there are too many things to do for a day-tour in Ninh Binh, it would be better to stay here for a night or two in order to have more time to visit this remarkable province. 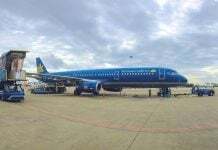 So what is the accommodation situation in Ninh Binh? Are there many big hotels and resorts? My answer is yes! 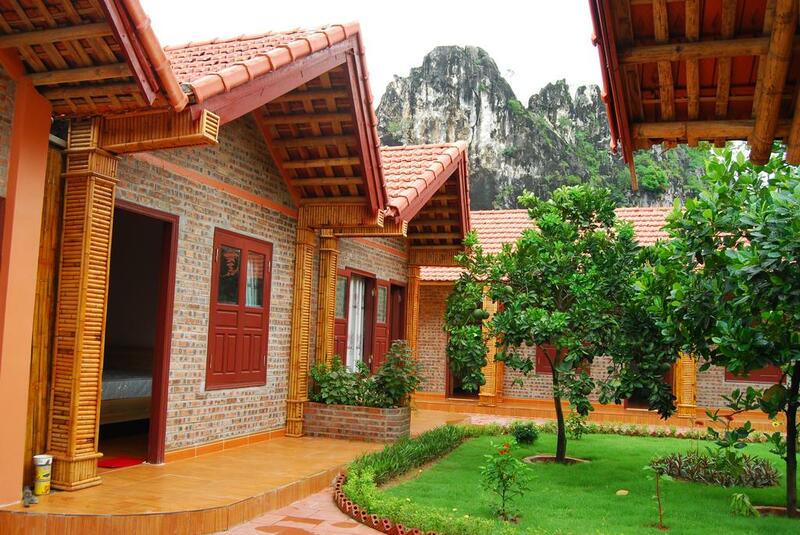 Since Ninh Binh is a popular travel site, it is easy to find a place to stay that meets your budget. From pocket-friendly hostels to beautiful homestays and fancy resorts, I have your back! Read this article to find out! 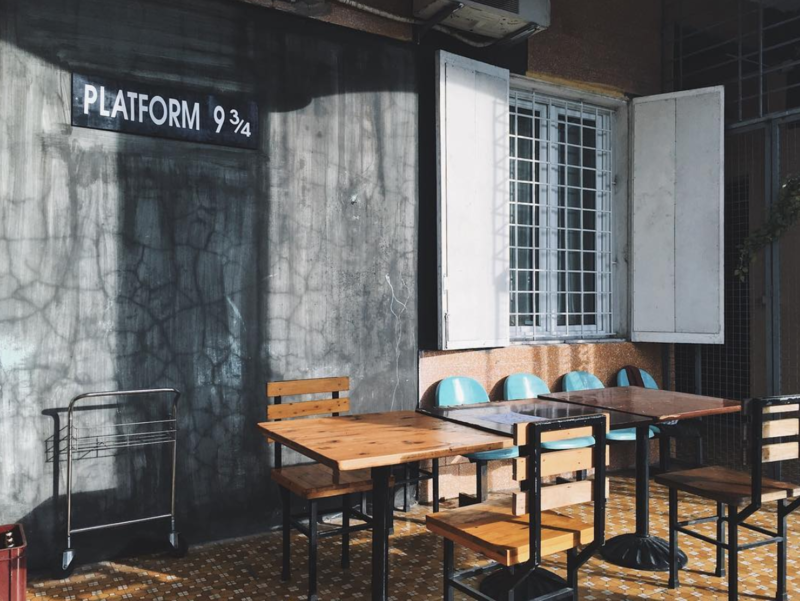 Have you ever imagined staying in a train station? Here at Go Ninh Binh hostel, the owner renovated an old train station and turned it into a colorful hostel. If privacy is your top priority, then you can book a double-room for two people. Otherwise, you will share a bed in a dormitory room with seven to nine other travelers. Every room has an air-conditioner and colorful lockers. 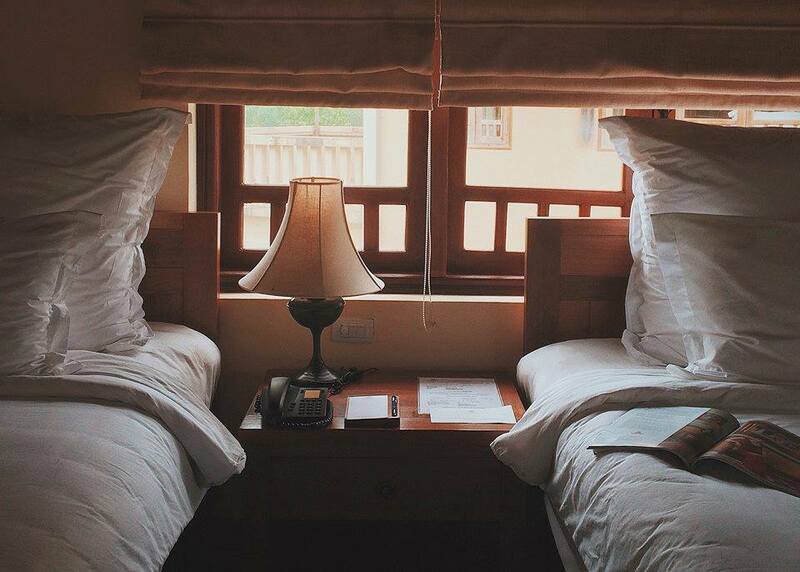 Each bed in the dormitory is equipped with a curtain, power outlets, and a reading light. The shared bathroom is quite clean and bright. The hostel service provides you with bathroom kits, such as shampoo, conditioner and shower gels, but no towel. In the lobby, there is a restaurant offering some simple dishes. You can have breakfast or get a bottle of beer. Travel is all about seeing new things and making new friends. Go Ninh Binh Hostel creates a great social space, with a football table, a billiard table, a dartboard, and chess for you to entertain and communicate with other travelers from around the world. So forget your smartphone for a while and enjoy the moment. If you wish to go around by motorbike, contact the receptionist for renting an automatic motorbike. 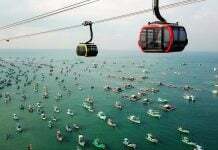 The rent price is around 4.8 – 6 USD (125,000 – 150,000 VND) per day. This serene homestay is located on the river bank, where you can spend an afternoon watching the sun go down the mountain. 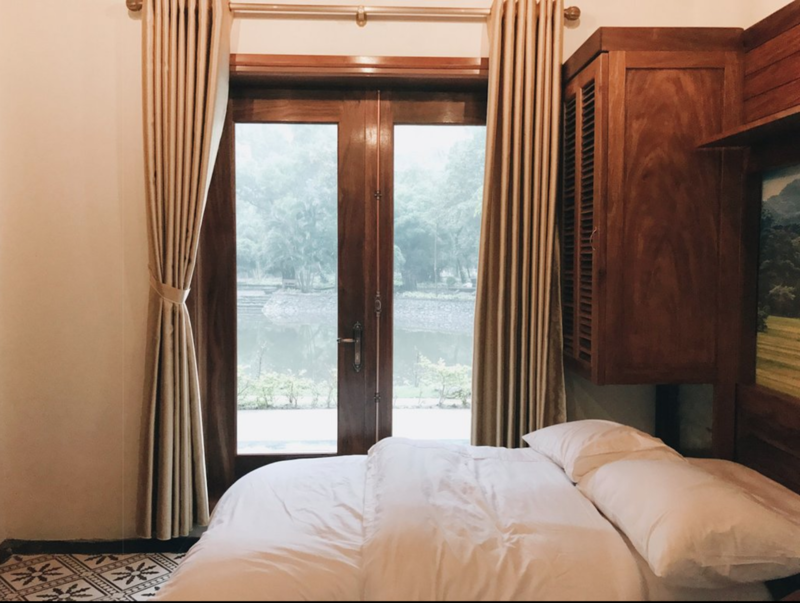 There are four types of rooms at Tam Coc River View Homestay: private room (including double-bed rooms, bungalows together with a big family room) and shared rooms (including fours beds and a bunk-bed room). 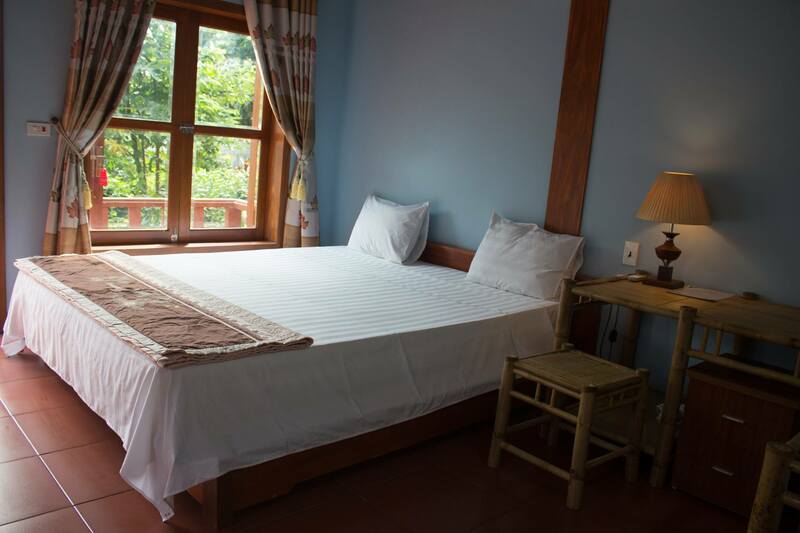 Every cozy private room at Tam Coc River View Homestay has comfortable beds, air conditioner, television, and a private bathroom. Even every wood bunk-bed in the shared room has a soft mattress, where you can rest your back after a day full of activities, a reading light, and curtain. There are two collective bathrooms in the dormitory so you don’t have to wait for long to take a shower. Previous guests agree that breakfast at Tam Coc River View Homestay is quite big and very delicious. You won’t just get a piece of stale bread or a bowl of mediocre noodles, instead you’ll enjoy an actual breakfast here, with banh mi, cheese, fried banana, a cup of coffee, and fruit. This is what I call thoughtful! 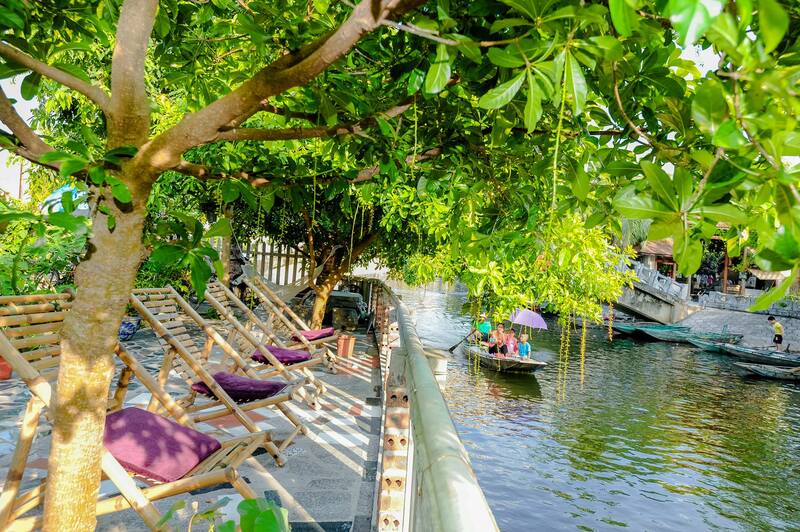 You can enjoy the feast on bamboo chairs and tables in the lovely garden, while watching other people sailing along Ngo Dong river. This is a good spot to sit down and map out your ideal day in Ninh Binh. You can rent a bicycle from the hostel owners for only 30,000 VND a day and ride to visit Bich Dong pagoda close by. Tam Coc Westlake Homestay meets the three most important things on my checklist when looking for a dream accommodation: beautiful decoration, clean room, and reasonable price. This cute homestay was built on the west side of Tam Coc, which takes you only five minutes of walking to Tam Coc boat station. The garden-view bungalows here are spacious and bright. There are two room options: double-bedroom and triple-bedroom. Following the rustic theme, the interior of this hotel is eco-friendly, using bamboo and industrial wood for furniture. If you can’t sleep without turning the AC on (like me), there is nothing to worry about as not only will you have an AC but also a fan, for those extra hot days in faraway tropical lands. Did I mention that there are a kettle and coffee in your room? You can make yourself a cup of coffee when you wake up to start the day. The large garden full of trees is where you can relax, write a journal entry of your trip, or play with the hotel’s friendly dog. There is even a dining section where you will relax and eat yummy breakfast. What’s great about it is that they will cook your breakfast upon your order in order to keep your meal hot and fresh. You can choose tea/coffee or juice to go with your dish and have seasonal fruit for dessert. You can arrange to rent a motorbike with the homestay owners for about 4.8 USD (120,000 VND) per day. Bai Dinh pagoda is only 20 minutes away, while Phat Diem Church will just take you 30 minutes travel by bike. These two places are worth a visit when traveling in Ninh Binh. If you want to stay closer to mother-nature, Chezbeo Homestay is what you are looking for. With a beautiful location in a valley surrounded by limestone karsts and small ponds, this homestay will give you a unique experience of staying in the countryside of Vietnam. The bungalows here are built with bamboo and a dried leaf roof. The many windows capture the sunlight and let the wind blow into your room (there is no AC). Another thing that you can’t find in your room is a television. It’s a good chance to really feel the life around you without the upset of technology. It’s time to leave your modern life behind and open the gift of nature. Imagine relaxing in a hammock looking at the starry sky at night, or waking up early to the sound of the forest roosters, maybe you see yourself in a beautiful yoga pose while watching the sunrise. Do you like mediation? If you do, this relaxing homestay is a great place to close your eyes, inhale the fresh air, and stay focused on your mind and your body. Well, good news is that you still have a wifi router in your bungalow. 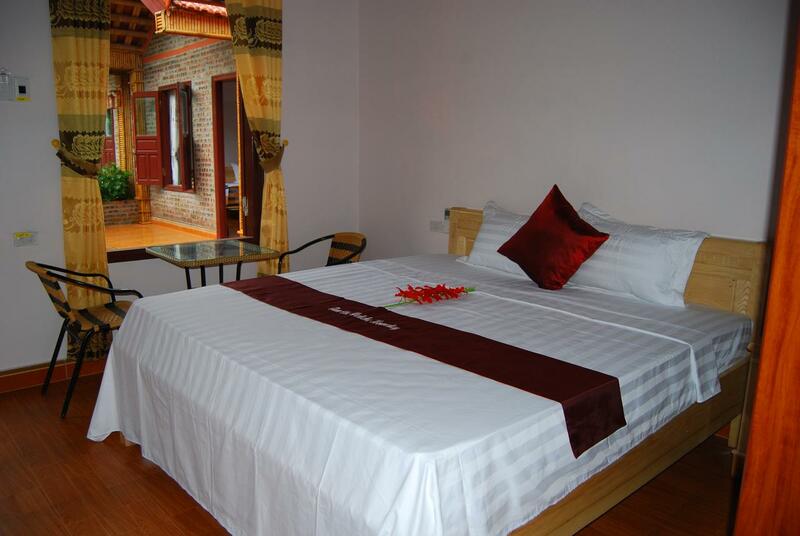 There is a budget room option for around 400,000 VND per person in a shared bedroom. So if your privacy is not a big deal and you don’t mind sharing a room, you can give it a go. To maximize your stay, this homestay offers free bicycles for those of you who want to see the nearby attractions. And there are free bamboo rafts for you to take a trip along the river. Pro tips: As there are a lot of trees around you and your room is open-air, you should bring bug spray to protect against mosquitos and other insects. A night in the forest can be very cold, especially during the wet season, so don’t forget to bring a jacket when packing. Click here for the location map! With an absolutely perfect location, the staircase to the Lying Dragon Mountain is just a few steps away from your room, this place is hard to pass up. If you are thinking about having a retreat, then you have come to the right accommodation! Mua Caves Ecolodge has a beautiful and cozy garden-view room. The mattresses here feel as though they are made of cotton candy or a summer cloud. Even though the mattress is what should sell you on this place, what makes this stay worth it is the bathroom. Never have I imagined such a romantic bathroom like the one here. If you are lucky, you will have a bathroom built following the mountain’s edge. Beside the standing showers, you also have a bathtub, which is made of rock, as well. After a couple hours hiking to the top of the mountain, you will be sweaty and the tropical heat will make your skin crawl. At this point, there is nothing you will want more than spending time cooling down in a beautiful bathroom in cool water. Luckily, there is a private bathtub waiting for you. It’s now time to turn on the music and soak in the water to enjoy a stunning sky view! This accommodation has a restaurant which serves Vietnamese food for breakfast, lunch, and dinner. You don’t have to worry about driving far for food when hungry. As a guest with Mua Caves Ecolodge, you will also have free access to the Lying Dragon Mountain. On the other hand, as Mua Cave is one of the highlight attractions of Ninh Binh, there will be tourists coming in and out all the time. It won’t be crazy noisy but still a little busy at peak visiting hours. 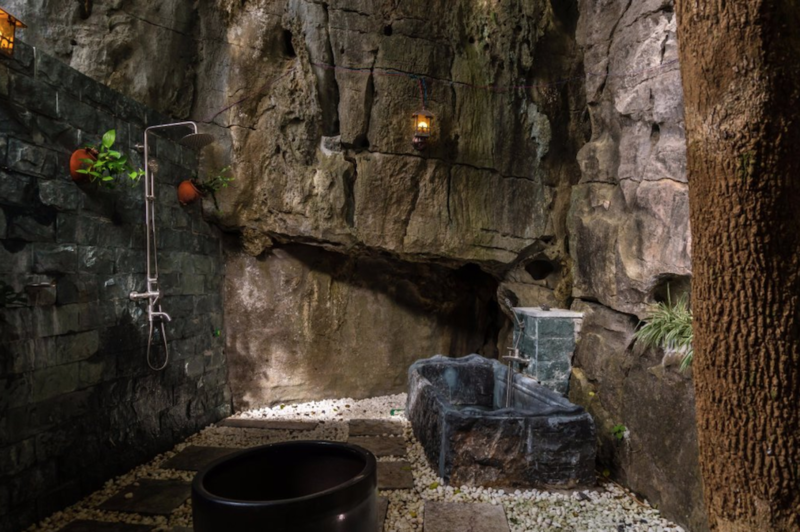 If this small thing is not a big deal for you and you have room for a few good stays during your trip, I recommend spending a night at Mua Cave Ecolodge when in Ninh Binh. 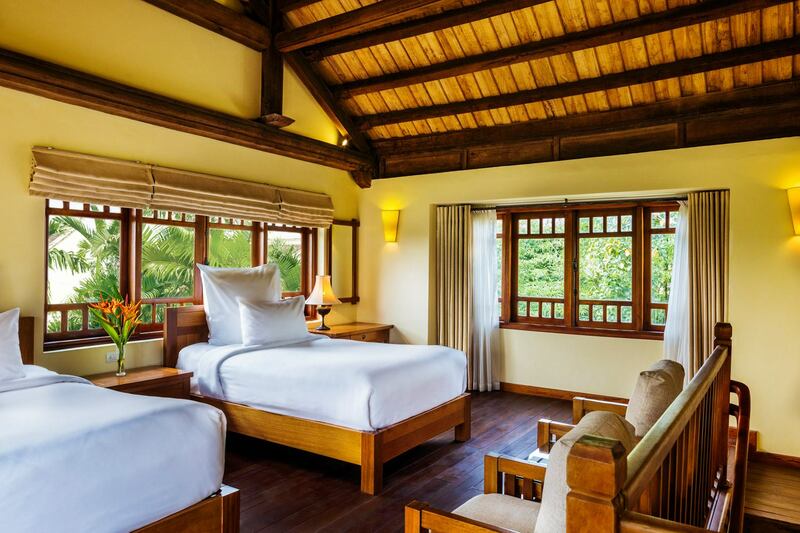 If you wish to spare a few days of your trip to relax in a beautiful resort, why don’t you spend your trip at Emeralda Ninh Binh Resort? The complex landscape is a harmony of ancient citadel architecture, with curvy bridges crossing lotus ponds, roof tiles, and terracotta floor tiles. You will find wooden interior finishes from the house columns, gates, and windows to the furniture in your own room. The wood touch makes the space look both luxurious and rustic at the same time. The room system features a cozy and elegant style, which will enhance your staycation. To ensure your wonderful sleep, a comfy cloud mattress topped with a fluffy duvet and puffy pillows awaits. Fully equipped with air-conditioning, television, and high-speed internet, you won’t need to leave your room. The lavish bathroom with a garden view, a bathtub, standing shower, and amenities will impress you, especially after a long day of sightseeing. What makes me love this resort is definitely their remarkable, enormous outdoor swimming pool, which faces the majestic mountains. 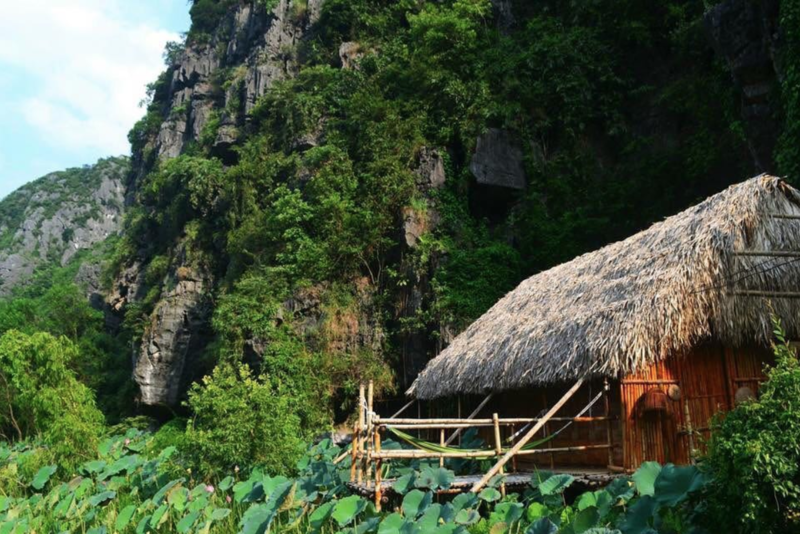 It is certainly a sweet escape from the summer heat of Ninh Binh. The resort has two restaurants that offer very tasty Vietnamese and Western cuisine. Would you like to take a sip of alcohol? Find your cocktail at the pool bar and a glass of fine wine at the wine bar. Are you thinking about having a massage day? Then you can contact the receptionist to book a retreat at La Cochinchine Spa, located in the resort. Click here for the location! 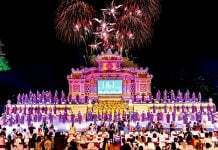 You forgoet about Tam Coc Garden hotel. Best hotel in the area imo.